Created in 2016 by Haley Gladstone, a Dover-Sherborn High School sophomore at the time, DONATE. (period) is a non-profit charity affiliated with A Place To Turn food pantry. DONATE. 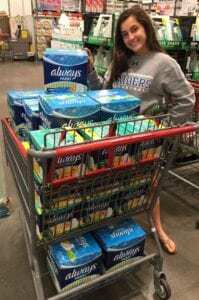 collects sanitary pads and tampons for teen girls and young women in need of feminine products. If you’re interested in donating, you can drop off boxes of pads and tampons at 46 Farm Street in Dover MA. There is a large DONATE. box on the porch for collections. You can also donate directly to A Place To Turn at 99 Hartford St. Natick, MA 01760. Any contributions are appreciated.